Adults with busy jobs and a difficult balance between family and other responsibilities often manage their stress by practicing meditation or yoga. The efficacy of both is well known, and meditation has become a way of life for overextended adults. But what about children who have a difficult time relaxing, focusing, and dealing with daily stresses? If you are looking for a day care that cares for the whole of your child, call Child’s World Academy. We have two convenient locations, in Monroe, CT and Peekskill, NY. The UCLA Center for Child Anxiety Resilience Education and Support (CARES) has piloted a program at a public school in which students practice calming, mindful meditation in an effort to help to manage their emotions. Teachers have taken note that, after meditating, students were able to calm themselves and handle difficult or frustrating transitions, such as school pick-up and drop-off, or other separations from parents in situations outside the school environment. 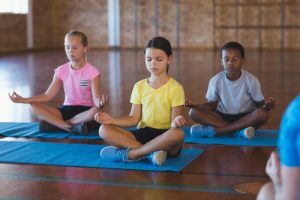 In older students, regular yoga and meditation classes have been shown to boost proficiency on standardized tests, reduce suspensions, and improve attendance rates. This may be a result of meditation’s effect on children’s ability to focus, pay attention, and display better self-control. Like adults, kids can learn to direct their energy in positive ways once they’ve learned some crucial techniques related to breathing and mindfulness. Not sure where to start with your kids? Try one of three different easy, accessible meditations with your children. The “elevator” technique, which asks you to visualize an elevator lowering from your head to your toes, is an excellent way to relax muscles. Counting breaths with your fingers is a quick way to control the breath and relax in any space or situation. Taking deep breaths before bedtime is excellent for kids who have trouble winding down in order to sleep. Have you practiced yoga or meditation with your young children? What effects have you noticed? Let us know in the comments section! Call us today if you are looking for fun and educational day care. Call and schedule a tour to see our facility and meet our staff.